The Castletownbere GAA Club (Cumann Luthchleas Gael Baile Chaisleain Bheara) is one of six GAA Clubs that form the Beara Division of West Cork. The Cork County GAA Board is divided into eight geographical regions and the Beara Division is the most Westerly of these. The Castletownbere GAA Club like most of the GAA Clubs in Beara was officially affiliated to the GAA in 1927. 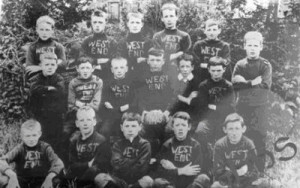 Gaelic Football was however played for many years prior to 1927 in Castletownbere and there were various teams throughout the parish as illustrated by the pictures below. 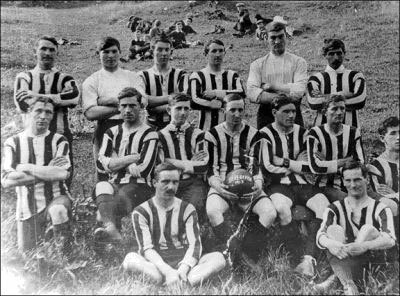 There was a team from the Town called The Magpies who wore Black and White jerseys. These were the colours adopted by the club when it affiliated in 1927. The colours did change to green and subsequently blue but have long since returned to the traditional Black and White. 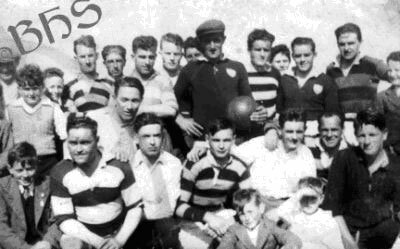 After 1927 things became more structured when clubs in Beara affiliated with the GAA. The first meeting of The Beara GAA Board took place in The Berehaven Hotel, Castletownbere on the 7th of April 1927. There was four officers elected of which three were from Castletownbere. They were Pat O Neill – Vice Chairman, Mikie Crowley – Secretary and Richard O Sullivan – Treasurer. Two Castletownbere members Dan Downing and Jim O Sullivan were named on the committee. Castletownbere didn’t enter a team in the 1927 Beara championship but in 1928 they competed in their first official Beara Championship when they lost to Garnish in the first round. In 1934 another team from the parish called the Derrymihan Woodbines entered a team in the Beara Championship. Castletownbere G.A.A. team 1930’s: Front row from left to right: John O’Sullivan, Jim Stack, Donal O’Shea, Tommy Brennan, Ted Lowney, Johnny Sheehan, Donal O’Sullivan. Back – Joe Hanley, Michael O’Brien, Joe Dudley, John O’Brien, Jack Ruth, Danny O’Neill, Arthur Hanley, Con Murphy, Paddy Crowley, Jim FitzGerald, Chris O’Shea, Derry Murphy, Fergus O’Neill and Arthur Merwick. 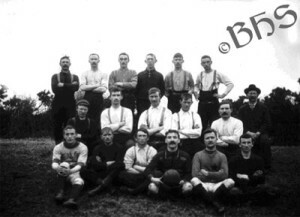 The club had to wait until 1942 to contest its first Beara Championship final and a further five years until 1947 to win the Beara Title for the first time. Between 1947 and 1976 the club won nine Divisional Championships. In 1963, 1964, and 1965 a second team from the parish Rosmacowen entered the Beara Championship. The two teams met in the Beara Championship in 1965 with the Castletownbere team winning. Between 1966 and 1970 Rosmacowen formed a team with Bere Island called St Brendan’s. In 1974 the Castletownbere club contested its first County Junior Final when a team captained by Donal Holland lost by 1-7 0-8 to Fermoy. This was repeated in 1976 when Castlehaven defeated a team captained by Ger Batt O Sullivan by 3-7 to 0-6 in the County Final. 1977 proved to be a historical year for ‘The Town’ when on the occasion of our fiftieth anniversary a team captained by Seanie O Sullivan and selected by Noel O Sullivan, Donie Harrington and Pierce Lyne won the clubs tenth Beara Championship and first County Championship. Rockchapel were defeated in the county final at Macroom on a score line of 3-5 to 0-8. In 1978 Castletownbere entered the Intermediate ranks and played at this level until 1986 when they won the Cork County Intermediate Championship. Like nine years previously Macroom proved to be a happy hunting ground when captained by Liam O Driscoll and trained by Donal Holland ‘The Town’ beat Kilshannig by 1-8 to 0-7. The 1987 season saw Castletownbere compete at senior level for the first time when they defeated Carrigdhoun by 4-11 to 0-5 in the first round of the championship. They were eventually beaten at the quarter final stage by the reigning County Champions Imokilly. 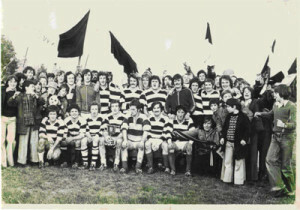 The club again played in the senior championship in 1988 before returning to the intermediate grade in 1989. The club has contested four County Intermediate finals since, in 1990, 1997, 1999 and 2006 but another county title has so far proved elusive. The club has also sampled under age success in the county championship wining the County Minor B Title on three separate occasions. In 1996 Michael O Leary captained Castletownbere to win their first Minor Championship defeating Canovee in the final. This was followed a few years later in 2002 when captained by Kieran Hanley we beat Gabriel Rangers to take the title. The feat was repeated the following year when captained by Richard Power we defeated Béal Atha’n Ghaorthaidh in the decider. Philip O Donoghue trained the 1996 team and he was a selector with Jimmy Murphy, Darren Murphy, Peter O Leary and Sean Regan on the 2002 and 2003 teams. 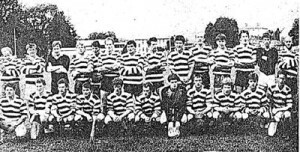 Although strictly not regarded as a championship as it is not played at fifteen a–side the club did win a County Minor 12 a – side competition (Minor C Championship) in 1992. The team captained by Michael Lynch and trained by Deccie Wiseman beat Ballyhooley in the final. The club previously had a ladies football section but now they form part of the Beara Ladies Football club. Beara Ladies have teams from U-12 up to senior. Beara Ladies have had several players and officials involved with successful Cork teams at various grades. Amanda Murphy won four All Ireland Senior medals in a row with Cork between 2005 and 2008. Laura Power accompanied her in the first three years. Susan Power and Blathnaid Wiseman won All Ireland Senior B medals with Cork in 2007. Peter O Leary was a selector on that team and was trainer of the Cork Senior B team that won the All Ireland title in 2008 and 2009. Amanda Murphy has an unequalled record in Ladies Football as she is the holder of 19 All Ireland medals 17 won with Cork and 2 won with Beara Ladies. Castletownbere GAA Club is a football only club today but hurling and camogie were played in the parish in the early 1900’s. The club has a small piece of hurling history since it was established in 1927. In 1967 the club won an U-14 hurling championship when they defeated Adrigole in the final which was played in Eyeries. In July of the same year Castletownbere lost to Adrigole in a junior hurling match which was also played in Eyeries. The final score in the game which was eleven a-side was 5-10 to 6-3. Castletownbere lined out as follows: Sean O Sullivan, Canice O Driscoll, John Cronin, Michael Hanley, Paddy E O Sullivan, Mylie O Sullivan(1-0), Barry Cremin(1-2), Denis Hanley, ? O Donovan(1-1), Sean O Sullivan, Pierce Lyne(2-0). Sub: Derry O Sullivan(1-0). In 1968 Deccie Wiseman, Mick Murphy, Joe O Sullivan, Anthony O Regan and Paddy E O Sullivan played on the Beara team that was beaten by Inniscarra in the first round of the county junior hurling championship. Beara played in the Carbery junior hurling championship in 1969. Castletownbere had a number of players on the team that lost to Dohenys in the first round. Since the 1960’s there has been work carried out on underage hurling at various stages but at present the club concentrates solely on its football exploits. Like hurling camogie was in the past played in the parish and below is a rare picture of a Castletownbere camogie team. There is also a history of handball in Castletownbere and it was in the past very popular in the Town. The Castletownbere Handball club had a number of fine players some of who reached the All Ireland stage. In 1975 Micheal Lordon and Billy Power were runners up when representing Cork in the All Ireland Minor Doubles (Hardball) Final. They had earlier won the Munster Title. In 1984 Micheal Lordon partnered Noel O Toole Kanturk to win the Munster and All Ireland Junior Doubles (Hardball) Title. They were also Munster Champions in 1981 and 1985.